glean to gather grain or other produce left by reapers; to pick up after a reaper; to strip (as a field) of the leavings of reapers. 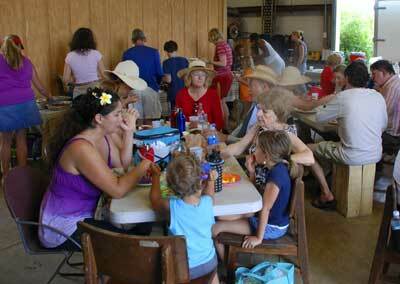 Gleaning Day at Bee Heaven Farm is a laid back end-of-season tradition. 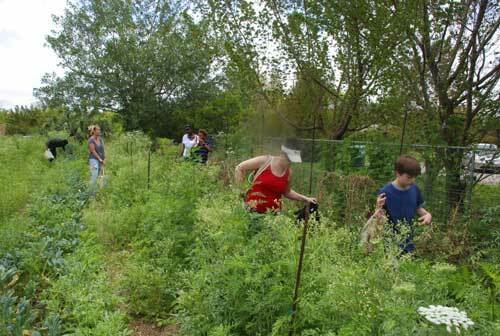 CSA members are invited to bring a potluck dish, and rummage through vegetable beds and pick what’s left. About 80-100 people showed up last Sunday and many families brought their kids. Waist high in weeds serching for morsels of food. People started trickling in at 11:30 am. Those who had done this before knew the drill. They brought totes and snippers, and wore hats and sunblock. Instead of sitting down to eat first, they wasted no time in finding things to pick. It felt like an Easter egg hunt, only in this case you were looking for tomatoes and other comestibles. Friends put me to work showing things to their grade school age boys. “Do you have carrots?” Mark asked. “Look, there’s some in this row,” I pointed out. He and Devin and I browsed down the row peering through weeds to wiggle carrots out of the ground. Getting fingers in the dirt was fun. Several sow bugs trundled out and the boys got animated. Forget playing video games. When was the last time you stuck your fingers in the dirt, tugged on fat orange roots, and communed with bugs? Heaven! Moments later we found ourselves over by the kohlrabi when the the horse snorted. Devin started. “What was that?” he asked. “Look at the other side of the fence,” I said. “It’s a horse, it’s a horse!” Mark exclaimed. You should have seen his eyes shine. I mean, it was a real, live horse! Grown up kids were also having adventures and making small discoveries. Over in the next vegetable bed, I showed Nathan how to hunt for snow pea pods hiding among withered vines. 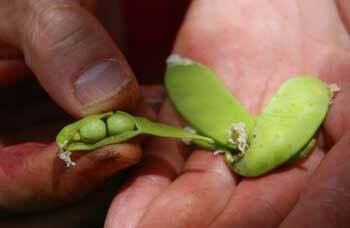 Some pods were bulgy, and sure enough, had small peas growing inside. “This tastes amazingly good,” Nathan said, munching on a raw pea. One row over were small bull’s blood beets, perfect for roasting whole. He could see round roots showing above the ground and it made sense to him what he was looking at. One good tug and a beet came up, dirt and and all. “It’s a beet!” he exclaimed (just like a kid). And thus a connection was made: here is a plant growing, part of a mass of undifferentiated greenness, but as you pick it, it changes to food. Magic! It was getting hot and I went back inside the barn, which was full of people eating and talking. The tables were loaded with lots of good food. A carrot and garbanzo salad seasoned with cumin was tasty, and I liked the Thai flavored mango salad. People ate almost all of the turnip slaw that I brought (recipe below). Managed to snag one of the last slices of Sylvia’s tart made with asian mixed greens, Hani’s goat cheese, and hard boiled eggs. She made her own crust and crimped the edge empanada style. You could taste the care that went into making it. The party was supposed to end at 2, but people were still hanging out when I left at 3. Once you get a taste of the farm, it’s hard to let go. Everybody brought food, and it was all good. Peel and slice turnips, then cut into matchsticks. (Or, you can shred them in a food processor.) In a bowl, combine turnips with red peppers and green onions. Make a vinaigrette with your favorite oil and vinegar, including thyme, salt and pepper. Stir well. Refrigerate several hours for flavors to blend. It IS great to get one’s hands into the dirt but more importantly to see where our food comes from and appreciate all the hard work our farmers do! Yay for Farmer Margie and friends, I miss my CSA already! Found your blog looking for a beet recipe but I have a slew of turnips too! Turnip slaw sounds great. I’m making it this weekend. Thanks. I miss the CSA too! Feel lost on Fridays… that was the day I went down to photograph the share and help out. Margie says there will be fruit and other goodies during the summer, so watch your inbox for more info. Enjoy! Looked through your blog and found your recipe for Easter Slaw. There’s still some carrots, kohlrabi and beets left at Bee Heaven, might go back to pick before Margie tills. What kind of vegetables are you getting now in your CSA? What’s your growing season like?